Very Sad News to Report - THE PORTAL HUB - Pinzgauers, Haflingers, Volvo 303s and more! All things not relating to the other forums. Many of you knew Jim Mettler who frequently contributed to this forum. He passed away last Friday following his bout with cancer. I think of any other individual who had such an impact on my life for the last 15 years. I was somewhat interested in Pinzgauers and was taking about them with friends over dinner at the Riverside Telescope Makers conference near Big Bear, California when Jim happened to drive up I his W and parked next to us. If it wasn't for that chance meeting I may have never got a Pinzgauer, got into the off road hobby, met many interesting people, and had many memorable off road trips. It's not often that you randomly meet someone with so many of the same eclectic interests of Pinzgauers, astronomy, music, electric vehicles, racing, etc. Jim will certainly be missed by many in the Pinzgauer community. Just heard the news, which made for a very dark night here. It was hard seeing Jim looking frail and without his usual beard but he was still in good spirits and charging on, seemingly without too much worry. He had a fun time making the short video we did together and spent most of the time smiling and talking about his truck and the stars, which is how I'll always remember him. Very sad to hear. Never met Jim, but always looked forward to his knowledge and assistance on the forum. We've lost a true renaissance man. Self taught and respected in several fields and social circles. We met ages ago when I was a fabricator for the ill fated SoCal Pinzgauers. Our common interests and odd sense of humor gave birth to a great friendship. We shared many meals, and laughs, as our children did the same in the wilds of Baja Mexico. My most sincere condolences to my extended family and our loss. He was a brother and friend. "and with the help of this sturdy stick" we will keep him in our memories forever. Very sad news and will be thinking of his family. My condolences to his family and many friends. I only knew him from the forum but was always impressed with his knowledge and willingness to help wherever he could. Terrible news. I heard about Jim's illness during the Idyllwild fires and evacuations this past July. He responded in the typical Jim way, "Hey I have cancer, but going to give it one heck of a fight". about Engineering problems. Exceedingly smart guy, and a real gentleman. I'll miss him sorely. Wow, very sad news. My thoughts and prayers go out to his family. Jim was a wealth of knowledge. He personally helped me many times with issues I was having and was always willing to go above and beyond what was called for and always had patience with us on the forum. 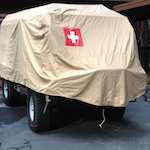 I've only made a few posts to this forum since taking ownership of my first Pinzgauer, but I've spent a lot of time reading over the posts and have read and re-read many things written by Jim. I never knew the man and I'm sorry I never got a chance to. My condolences to his family and friends. I'm sure I'll still continue to use his knowledge that is parsed throughout this forum and will certainly donate again and again to this site to help ensure his contribtuitons to this communtiy continue to live on. Can we dedicate the Electrical section to him? Just a little note below the section with something like "Dedicated to the memory and knowledge shared by Jim M"? Last edited by audiocontr on Wed Oct 24, 2018 6:28 am, edited 1 time in total. Can we dedicate the Electrical section to him? Just a little note below the section with something like "Dedicated to the memory and knowledge shared by Jim W"?